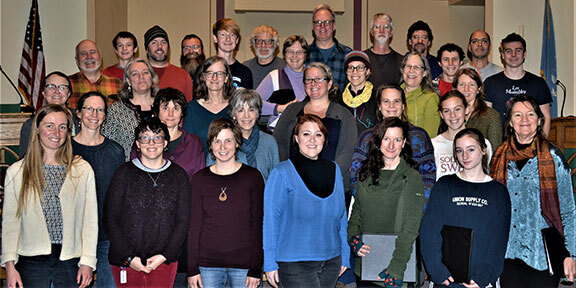 Burning Bright, a group of Decorah-area professional and amateur musicians, will offer their annual benefit concert in two performances Saturday, Dec. 15. Performances are at 4 p.m. and 7 p.m., at First United Methodist Church, 302 W. Broadway in Decorah. This year’s theme is “Exultation!” – and the performances celebrate the 20th year of Burning Bright. Otter Dreaming and Kathy Reed are co-directing. Dreaming is a pianist/organist, composer, and folk musician. Reed is an instructor in music at Luther College, where she teaches harpsichord, ear training and Paideia and directs the Collegium Musicum. Along with the adult choir, the concert will feature a choir of children and youth, other small vocal ensembles and various instruments, both as accompaniment and as stand-alone groups, including fiddle, guitar, recorder, banjo, piano, oboe, folk harp, bodhrán and other percussion. Each year the musicians donate concert proceeds to various nonprofit organizations. As has traditionally been the case, the Farmers’ Market Coupon Program for clients of the Decorah Community Food Pantry will be one of the beneficiaries. Two of this year’s beneficiaries work with immigrants: Neighbors Helping Neighbors, a local effort to assist immigrants and their families in rebuilding their lives following an immigration-related crisis, and the Northeast Iowa Peace and Justice Center’s Immigration Working Group, which provides legal consultation for immigrants and helps them understand their rights. The remaining beneficiaries for the 2018 concerts are Re-Member, which works with the Oglala Lakota Nation on the Pine Ridge Reservation in South Dakota to improve the quality of reservation life through relationships, shared resources and volunteer services; and the New Hope Jeremiah Project, which focuses on programs for children and feeds hundreds of members of its Cape Town, South Africa, community. Suggested donation is $15 per adult, with an $8 minimum.